The little Toyota Echo that I was driving is nothing like the Nissan X-Trail that I used to make my way out into rural south-east Queensland in. It’d been years since I had driven a manual car, let alone one with absolutely no power steering. As I drove past the trucks and utes around the town of Beaudesert, I felt small and could be easily crushed at any moment by some wayward vehicle that didn’t see me. This is the heartland of the Australian National Party – a political party that purports to be representative of the rural community, and who currently holds federal power in coalition with the big business orientated and ultra conservative Liberal Party. Yes, that’s right.. Australia’s ultra conservative party is called the Liberal Party. The National party once dominated Queensland’s state government for 30 or so years, and ruled the state with an iron fist, and few over age of 35 have forgotten that. Many of the people that live out this way long for the glory days of the rural party running the show. That’s because these days things different out in the country. The wealth that used to sit in the hands of the landowners has been stripped away from them by successive droughts, and destructive trade dealings that have come as a result of supermarket firms monopolising the distribution chain. The oversize utes I pass are fuelled at run-down service stations, and they pass through towns that feel like a shadow of what they once were. These rural communities that once made up Australia’s primary industry now feel like they are crumbling into dust. Outside of the towns, the landscape is still beautiful. As I drive out of Beaudesert and towards John Lavery’s house I look out over the horizon and see Mount Lindsay in the distance, shrouded in a blue haze, while the landscape between myself and the mountain was a bobbling ripple of hills that glowed yellow and green in the morning sunlight. There may be limited opportunity for work out here, but it’s a beautiful part of the world none the less. I’d arrived in Queensland the day before and had stayed with a friend of mine in Brisbane that night. It’s been a tense 8 or so months at work, and I needed to get away for a bit. As I drove out of Brisbane and into the country I started to feel relaxed now that everything that seemed to be a problem was over a thousand kilometres away. Today was a day for exploring John’s beautiful typewriter collection, and of catching up with good friends as John’s wife is a lovely lady. John’s workshop wasn’t how I had left it. 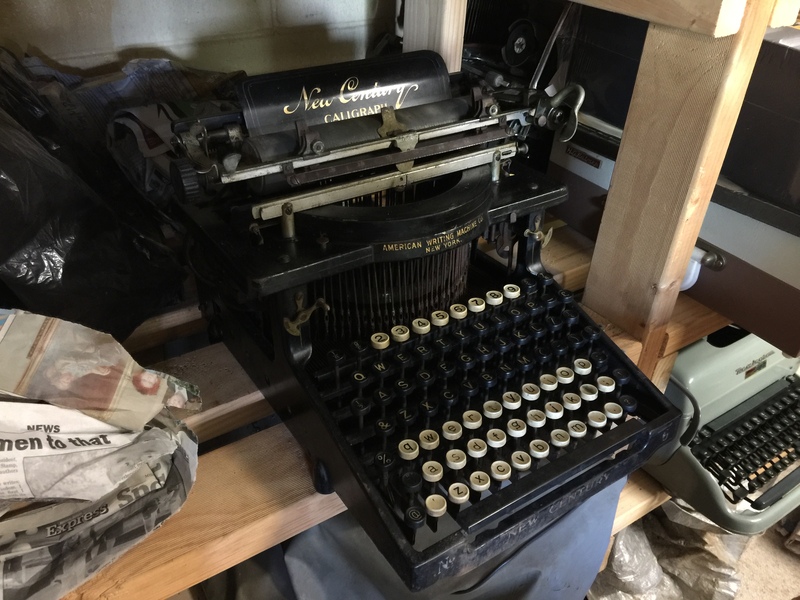 A large empty space that was once in his down-stairs area was now no longer vacant, but filled with shelves loaded with machines, and tables covered with other typewriters John was currently working his way around. His workbench had also changed – with the rickety shelving above his benches now moved, and a handful of waist-height shelves were now in the middle of the room holding partially completed projects. 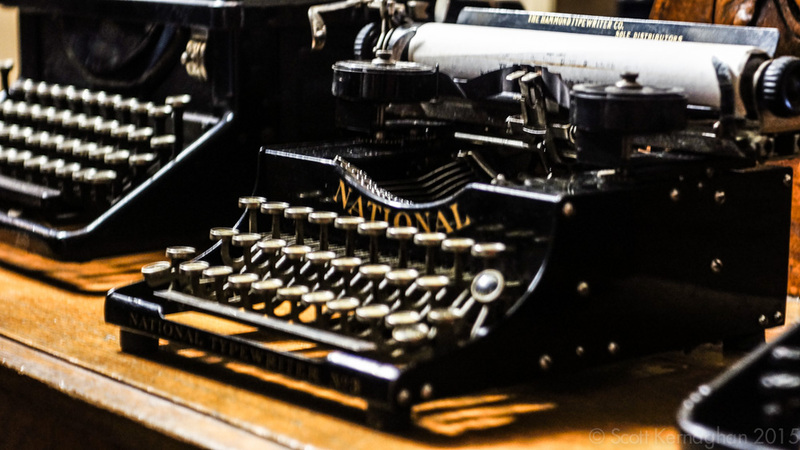 But that marvellous typewriter smell was still there. I wonder if I could make a bottle of the stuff to spray on me to make me more attractive to writers. Screw your Chanel No.5, I have Underwood No.5. John and I sat down and talked politics for a bit, but eventually we got into the good stuff – John’s collection. 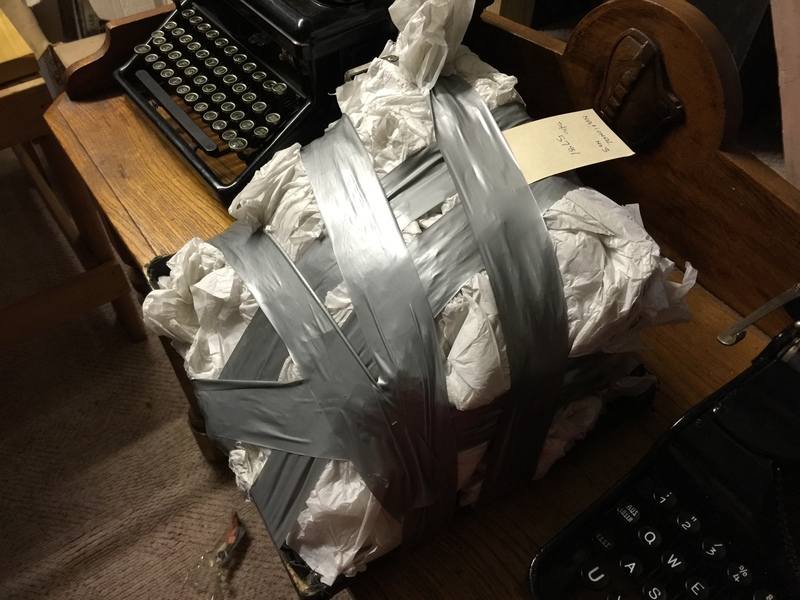 With the new shelving up it made it easier to start digging into the long forgotten wrapped parcels that are still hidden in the back corner’s of John’s collection. And despite John being settled in his home for a couple or so years now, there were still a few machines packed up for transport that were tucked away, somewhat forgotten about. As it turned out, there were a few lovely discoveries to be had this day. But first – John wanted to show me some of the beautiful machines he had been working on, or recently acquired first. 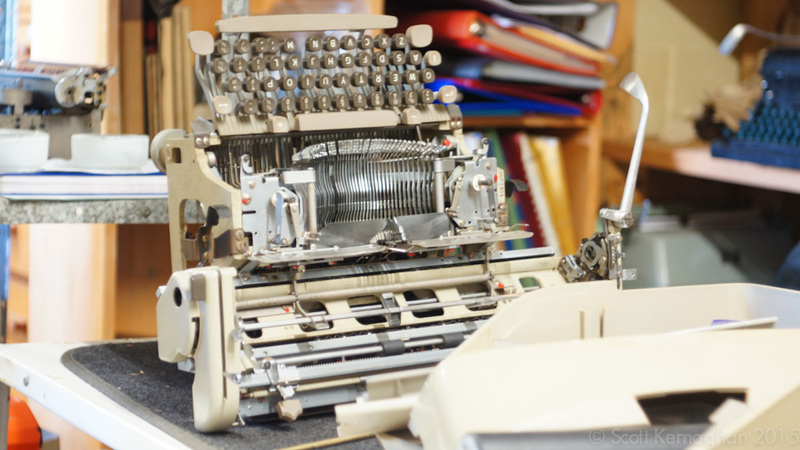 John has been steadily working away on building and repairing a large collection of Olivetti machines. 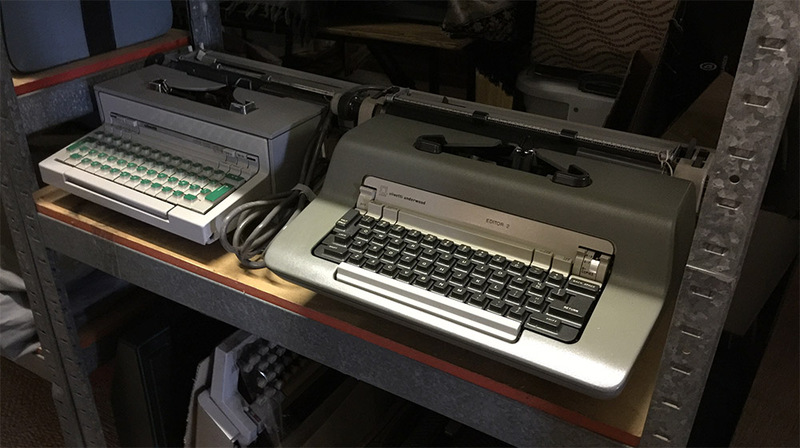 He has Lettera 22s and the variations there-of almost bricking up a wall, while there’s some standout machines like an Olivetti Praxis, and an Editor 2, which was previously in Brian Brumfield’s workshop in the USA last that I heard of it. The Olivetti section is forming an L around this table. There’s shelves behind these shelves, and shelves behind me. Besides the Olivetti archive, sitting on a table in front was a machine that John is particularly proud of. 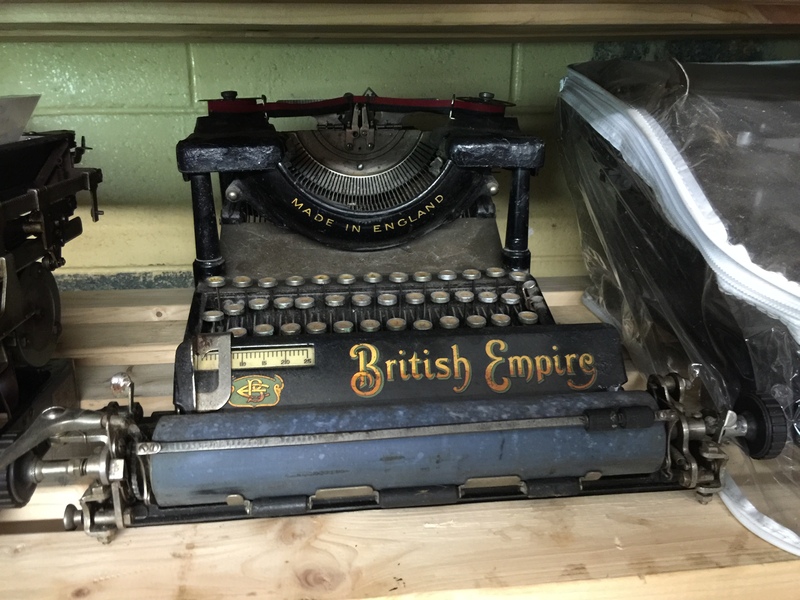 It is a machine that John had been hunting for quite some time, and he was able to acquire – along with several other machines, over in the UK which he’d recently gotten shipped to Australia as a partial container load. May I introduce: The Adler Special. John has spoken very highly of these machines the entire time I have known him, and he recalls them fondly from his service days. I can see why. It’s a very well made machine, and it types wonderfully. John has also been working on an interesting little machine of late that has been part of his collection for a while. This machine was sitting right next to the Adler Special. A ‘Home Blick’. Which is something of a simplified Blickensderfer that is relatively feature poor compared to the Blick 5. Take me home, Mr Blick. That…. and John’s gorgeous Noiseless portable. John’s workshop is situated in a different room, and John took me back into there to show me the machine that he currently had sitting on his workbench. To be honest I was actually quite surprised by what I saw… I didn’t realise before that John had a Molle 3. He’s still working on it, but it was running just enough for me to get an idea about how it typed, and how it felt. Which is to say, I can’t see myself writing the great Australian novel on such a machine. The Molle’s design is utilitarian, and reminds me very much of late 19th century engineering. In a way it is beautifully ugly. After John and I looked over the Molle and discussed its mechanical details, I started to dig into John’s shelves to see what I could find. One of the first great discoveries that I made was of an Olivetti MP1 that John owned, but had long forgotten about. MP1 in grey, glossy paint? Really? I’d never seen one before. And then there was the Mercedes. So very, very Superba. Check out the ringed numerals. 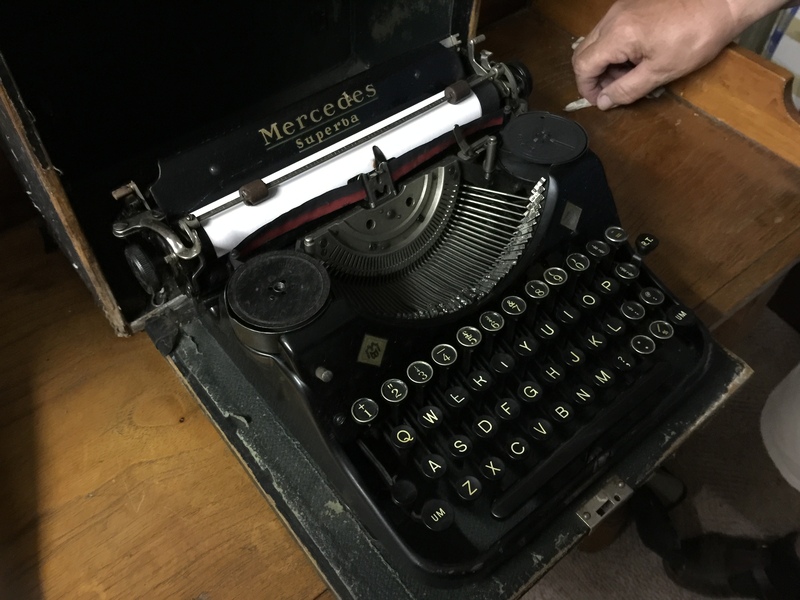 The Mercedes of typewriters? Maybe. Tucked around in a very dark corner I found a shelf with a couple of very interesting machines. John appears to have been doing some work on his Visigraph, as the machine was looking clearer, meaner and nicer than I had previously seen it. Maybe it was just the light…. but who cares! I don’t think anyone is going to argue about value of working on this machine – especially as these Visigraph machines are quite rare. Balled up very near to John’s Visigraph was another machine of note – an exceptional machine that John had long forgotten about. 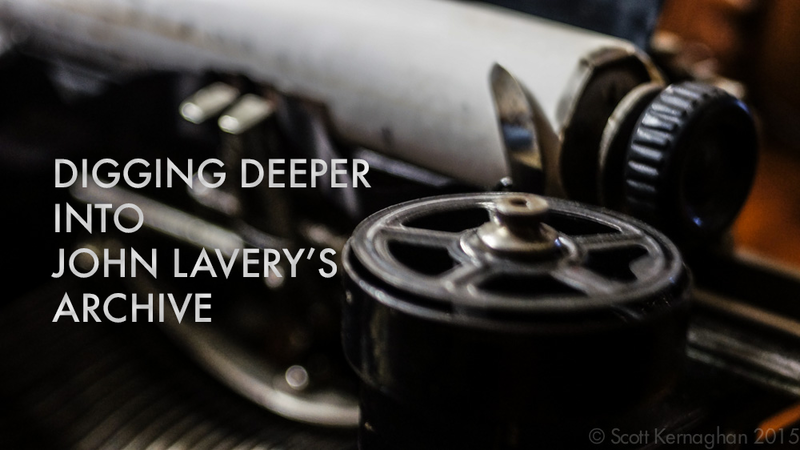 Once I had cut the typewriter free from its bonds, I have to say – I became very excited by what I found inside. Yep, it was a near flawless National 3 typewriter. 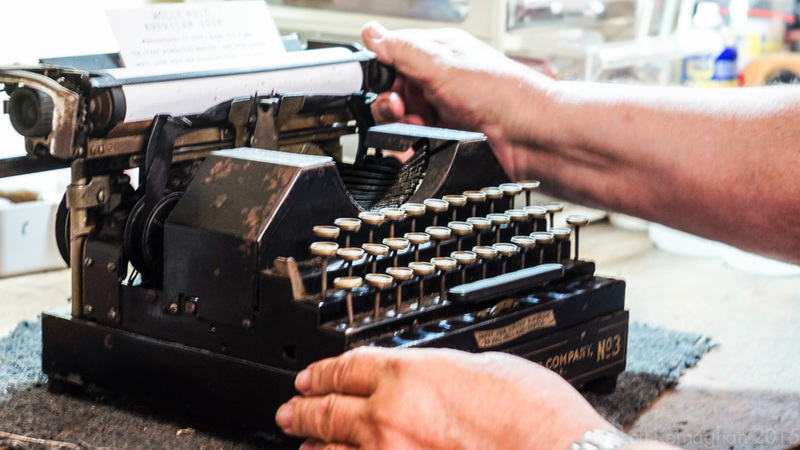 While this machine’s design really shows it’s age, it is filled with wonderful old-world charm that almost betrays its Industrial revolution origins. It just feels smart and sophisticated, and has a very similar charisma to John’s Noiseless portable. I’m glad I brought such a machine our of hiding while John also recalled how he purchased the machine in Castlemaine in Victoria some years back – for an absurdly cheap price that the seller seemed to be glad to get. John and I returned to his workshop to have a look at a few more machines there. On his current project shelves is the Stott L1 that I had posted up to him a few months back, but had sadly not survived unhurt by Australia post – even though I split the machine into two seperate packages in order to try and save it from being damaged. The machine was now sitting at an odd angle on his bench, displaying with some awkwardness some of the bent metal in the carriage. A very sad looking Stott L1. metals are my thing, and after a bit of discussion I assessed if the part could be safely bent back without breaking it, and I made a successful attempt to do so. Hopefully that will sort out some of the issues with this machine now, and John will be able to get it back into action soon. On the shelf below the Stott, there’s another quite rare machine that John has been working on. It is a Royal Emperor. Not an Empress, an Emperor. A machine that pretty much no one seems to know much about, and John is the only collector I have come across that has one in his collection. 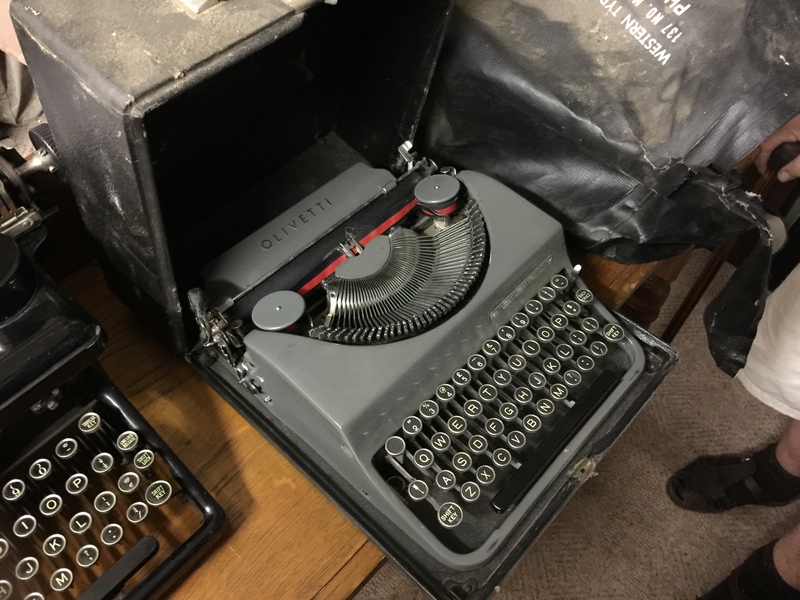 It is a great looking electrical typewriter, but sadly as there seems to be so few of them out there, there’s also very little information about them. Looking at the features of the machine, I can only conclude that in its age it would have had to have been one damn expensive typewriter. 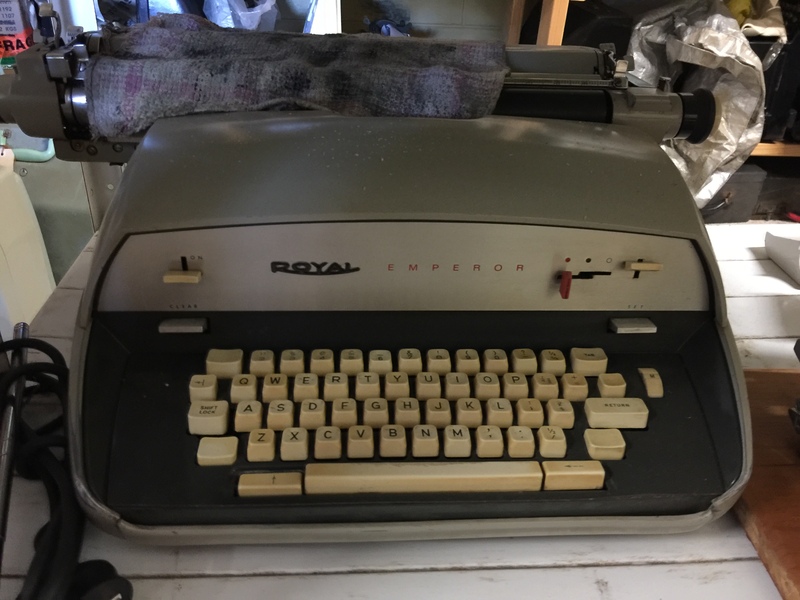 A largely un-affordable top-of-the line machine in a market that was beginning to be dominated by machines with considerable less moving parts and greater capacity like the IBM Selectric. On the shelves behind these current project machines machines I found another machine in serious need of attention, that I was very sad to see was in the state that it is in. It is a somewhat decaptated ‘British Empire’. The machine appears to have sustained a substantial impact which has destroyed the carriage rails, and partially fractured the iron frame. I love the decals on this machine, and it feel awful to see it in this poor of a state. 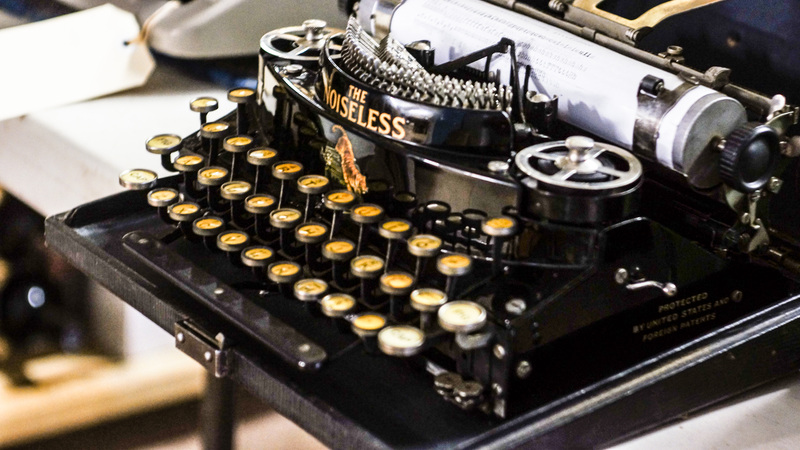 Sometimes the passage of time and the things that happen in daily life can be so very cruel to typewriters. While plucking over the carcass of the British Empire and looking at the bits and pieces either side of it I discovered something really interesting. There was a very large machine tucked away on a shelf still balled in paper, without anything as much of a hint as to what was inside. Naturally, I felt inclined to strip this packaging off, only to be greeted with a magnificent sight – a ‘New Century’ Caligraph. 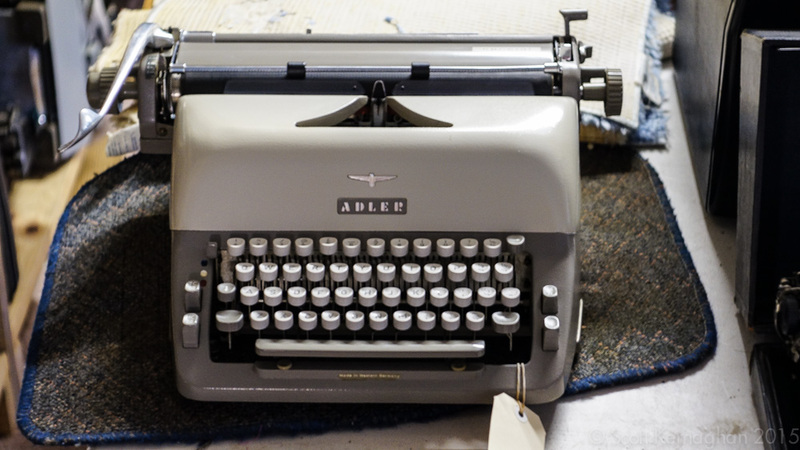 And it is a cracker of a machine too, being that it is in such great condition, with only slight damage to the paint on the front of the typewriter. I have no doubt that this machine will clean up well. It’s destined be a stand-out machine in John’s collection. I never thought I would see one of these machines in Australia. But hey! here it is. And…. WOW! 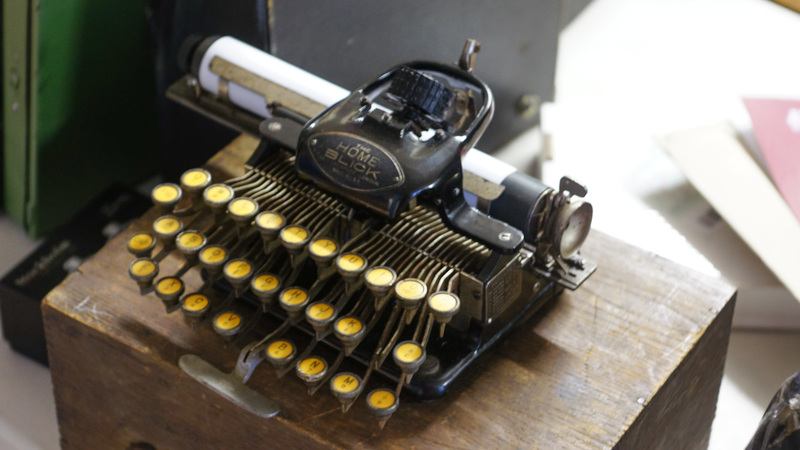 We’re already into another New Century – since this machine was made in the ‘new century’. All in all it’d been a great day in John’s workshop. As I was leaving John handed me a machine machine to take home with me that is in need of a lot of love and affection. A little project for me to tackle when I have a moment, which I am hoping I will get soon – along with blog post on the machine. I was sad to leave John’s place, but as I was driving out the region I greeted by the sight of the sun beginning to set over the the Great Dividing Range to the west. It is always good to see John and his wife Margaret. And I’m glad I was able to make the effort to pop over to his place while I was back in Queensland. Wonderful post. I have gotten so much information from the content and videos at McTaggart’s Workshop. I would hope that he would post more videos. Some day I’d like to visit Australia and shake John Lavery’s hand. A fascinating tour. Thanks for taking us there! Always good to dig into the collections of others. Well that was a real treat! 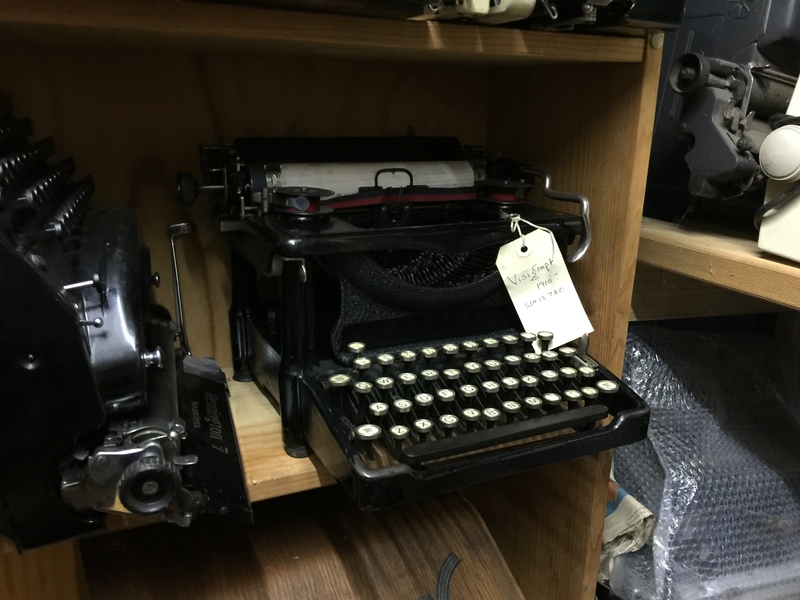 Lots of typewriters I’d never heard of before, and a few on my wish list. Oh yeah. So many machine I absolutely loved! Thank you so much for giving us a peak into John Lavery’s (Mactaggart’s) Workshop. I have only known John for a short period of 5 months. 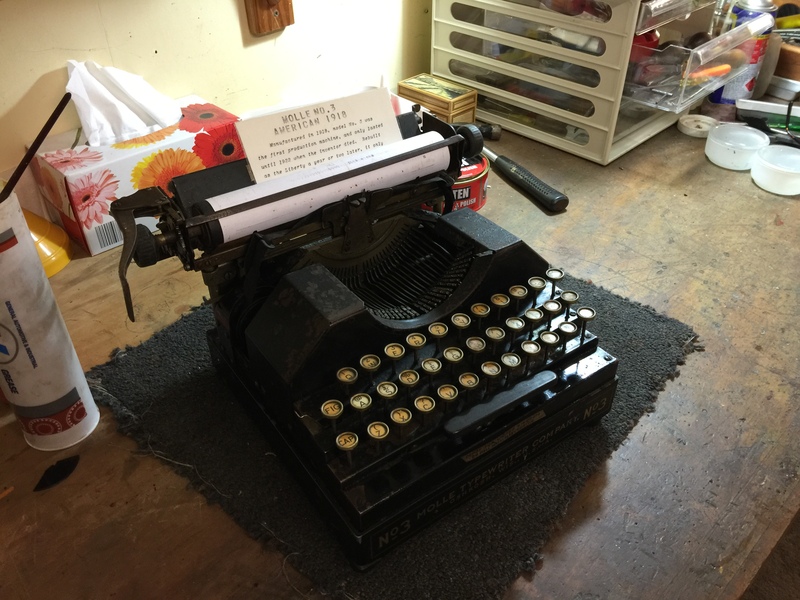 However he has taken me under his wing as an apprentice and really is a gem in the typewriter community. He’s a great guy. He’s been very kind and patient with me and my repairs! Ahhhhh wine and typewriters. They don’t always go together so well. At least no one has yet been arrested for typing under the influence. I once had two Royal Emperors. They were made in the early sixties. They both were able to use carbon and fabric ribbon. Their mechanisms and their performance were most like a Royal RE of the mid-fifties. The ones I had–especially the coral-colored one–were very superb machines. I miss them.